Today, we are speaking with guitarist-singer Randy Ludwig, of LA’s pop act Dizzy Box Nine. Can you give us a little background information about yourself? How did you get into music? I remember being in 5th grade and having this Casio keyboard. I would write both rap songs and rock songs as early as then. That Casio had a sampler on it, which was pretty nice, me and my friends would just experiment with different things. I would write a lot of lyrics back then with basic melodic structures kind of arranged. I would sometimes record them onto tape and just play for friends. My mom made me learn piano before she would allow me to start guitar. So, at age 11, I began with piano lessons, then quickly moved to guitar 6 months later. I would record all kinds of stuff. I would first record guitar onto tape, then play that back, and on a different tape deck, I would record the first guitar part, and then add vocals and another guitar part live. It was fun to experiment, although the sound quality was mediocre. Yet, at that time, I knew of no other way to do it. From that point on, I just kept writing and writing. After college, I started a band in Phoenix Arizona. We were a two-piece group who played at numerous venues in the Phoenix area. It was a great learning experience. One project lead to another, and here we are with Dizzy Box Nine. Tell us a bit more about your 2016 album Electric Illusion. It’s a 12-song pop album recorded entirely in my living room. I had my good friend Lawrence play drums on several songs, and I basically played the rest of the instruments. I wanted to create an album that inspired hope in others. It’s really about all that is good with the world. For whatever reason, I’m really good at writing sad songs. They come very easy to me. But, with this album, I wanted to keep that sad stuff out of it. I wanted something catchy, poppy, and inspirational, while still staying authentic. I think if you listen to the lyrics, you will see the authenticity remained. For instance, check the song “Fantasy”. That song really is a reminder for all of us to get going with what we know we’re here to do. Each of these songs tells a story. Each of them reminds us of something important. This is a record that speaks to you in different ways the more you here it. What sort of work have you put into the recording and creative processes for the release? It’s ironic now-a-days, if you’re an independent artist, you need to also seemingly have a Ph.D. in marketing or something similar to get things going. There are so many great bands that will never be heard as a result of lack of proper marketing. And, marketing takes money. To do it right, it takes lots of money. I can break any band with the right budget. But, I love performing, and I love playing live. But, coincidently, I also love psychology and marketing. Yet, my budget is limited, so this means you have to get creative. And, really, you just need a team of people who believe in you and are willing to help you share your music with the world. We’re still finding that balance. I’ve tried a lot of marketing ideas that don’t seem to work so well. But, you have to have amazing music, and an amazing marketing campaign, and the odds are still very much against you. You need more than a little luck to make it. But that’s ok. It’s all about the music, and somehow, it seems to all work out. I’ve been influenced by so many bands. Some of my favorites include: Blink 182, MXPX, The Refreshments, The Cars, Tom Petty, Sweet Water, Prince, Maná, and Local H. I listen to pretty much anything, even country and classical piano music. There are so many good country bands out there these days. They have some pretty strong songwriters, and the music engineers are pretty top-notch. Our music is such that we could open for nearly anyone. And, we’d be happy and grateful to do so. 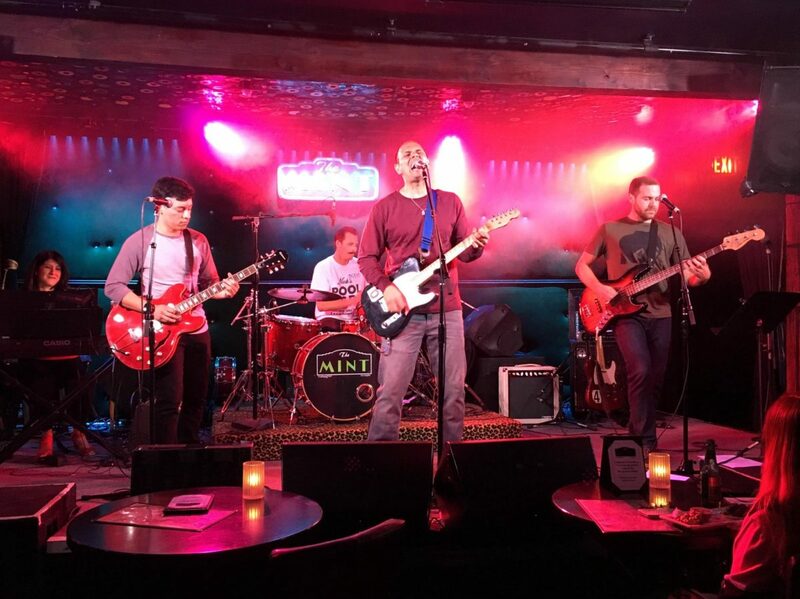 Dizzy Box Nine is an evolving and eclectic band with a touch of improvisation thrown into the mix. On lead guitar we have Tony Robles, who is truly an amazing guitar player. He has a very melodic style to his playing, with the intensity of Eddie Van Halen. After watching him perform, you would think he practices for ten hours a day! And, who knows, maybe that’s exactly what he’s doing. Cody Bishop is on drums, and can keep the beat with the best of them. He brings a lot of dynamic punch to our live shows. He’s such a friendly and positive person. And, he’s a surfer, so there’s that! Lorraine Miramontes is on the keys. She’s a very talented musician who brings a lot of musicality to the shows. Often she just blends in with the band, but one of these days we’re gonna give her some solo time so she can share with the world her musical chops! Michael Fileta is on bass guitar. He plays with such passion, and isn’t afraid to take a chance. He also knows a lot about music in general, and can play several instruments, and also has a strong voice. Additionally, Michael has a lot of ideas and does his best to keep us growing as a band. There have been other players as well who have been involved in different ways. Once a member of Dizzy Box Nine, always a member. Schedules change, people move, and life happens, but that’s how it goes. Thus, there have been others have helped us evolve as a band, and aspects of their efforts and personality are still with us when we play live! For instance, Lazaro Zarate has played guitar with us in the past, and is a very talented individual who is also working on a recording arts career. Also, Lawrence Dunlap has been there from the very beginning. He’s one of the most talented musicians I know. He’s a tremendous drummer, guitarist, and singer. He also knows a lot about the recording process, and has really helped me develop as a musician. He also played drums on several songs on our debut record. He now lives in Missouri, but I still think of ways he can stay involved. Perhaps one day we’ll all do a show together, and get everyone back on stage together, at the same time, and just have some fun! What should listeners expect from your music in the future? How can interested NeuFutur readers locate samples of your music? How has the radio response been for your music? What does 2018 hold for you, your music, and Dizzy Box Nine in general? More music! And a Christmas song as well! We also hope to get on some late night TV shows and just keep playing tons of live shows! We’re excited about our next record. One song in particular, Like A Star, I dedicate to the world. There’s a lot of tension in our world, and so much of it comes from insecurity, envy, and fear. I hope the world gets a chance to hear this song, and reflect on it. It will be ready soon! We’re already playing it at our live shows, and it will be officially recorded and released very soon! Thanks so much for the interview! We really appreciate it!